the story of Aja: The animals we live with. It is quite clear how much pets become a part of who we are and important members of the family. We lost our beloved Aja a year and a half ago and it was such an emotional time that I start to get misty eyed just thinking about it. I feel guilty that the subsequent death of my mother in law, equally as emotional and draining does not inspire the same emotional response now! Aja was almost 14 when she became acutely ill. She had joined our home as a 9 week old shepherd puppy, all paws and floppy ears, and began her life growing up with my adorable 18 month old son Alex. We had lost our first rescue dog Neffie a month before to liposarcoma (being a doctor I will have memorized all the fancy names!) We battled that sucker for 3 years!, surgery, radiation, chemo and then more chemo and she was only 4 years old when the end came. She was practically born with cancer when I think back on it. That was back in the early 90?s and pretty much how we started out on the road to credit card debt. Back in 1993 every radiation treatment was 80 dollars a pop at the Animal Medical Center in down town Manhattan and I think we did 21 of them. And Neffie was not a dog you could leave at the center and pick her up at the end of the week, it was down and back, down and back three days a week, while I was pregnant with my son. I even remember driving down the day of the first World Trade Center bombing in Feb 1993, seeing the smoke rising into the sky and wondering what this world was I was bringing my son into. Neffie adored Alex and would have protected him with her life. 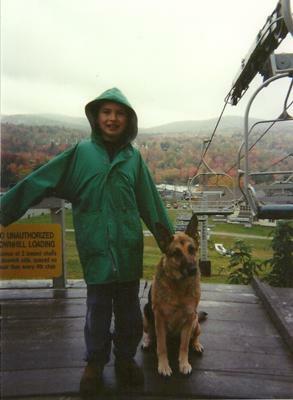 She was a female shepherd and a fiercely loyal pack member, but when we finally put her down (in December 1994, still brings back the tears) we were bereft without a doggie companion and decided on a puppy to be safest with a toddler. Aja was purebred and a German (not American) shepherd, bred as a schutzhund, with a straight back, a thick tail and the most beautiful dog I have ever seen. As I said, all floppy ears and paws and awkward pouncing as a puppy but loving and the smartest dog ever. She also adored Alex and he adored her. He had named her: when he looked for Neffie as an infant, he twisted around in our arms and called "AhJah? AhJah?" which we took to be his way of saying Neffie. So being Steely Dan fans, it was easy to change her AKC litter name of Lacy to Aja. I can skip all the marvelous things Aja did in her doggie lifetime, its hard to believe 14 years went by so fast! She was amazing with children, including autistic children who were always fascinated by her and she tolerant of them. On labor day weekend 2008 she collapsed while we were in Vermont, unable to use her hind legs. Initially I thought she had fractured her spine or slipped a disc. We took her to the emergency vets in Massachusetts who gave her steroids and wanted to admit her but I said no thanks and drove her myself back to Westchester to the Katonah Bedford Animal Hospital where she had had expert surgery the year before on a pyometritis. I cried the whole way thinking this was it and we were losing her. She lay on blankets in the back seat and just stared ahead refusing food and drink. I think I got her to take a tiny lick of vanilla icecream, once one of her favorites. It was labor day so the bill was going to be extra high but I tried not to think about it. I would cash out my retirement savings for her, crazy as it sounds, because she had loved my family so unconditionally for so long and she deserved our love and care now. The vet on call examined her and told me something surprising: her bladder had ruptured and she was in kidney failure. He wanted to hydrate her, put a catheter in her bladder and see how she responded. Not her back at all (and thank God I had not left her in Massachusets!) I told him OK and that if she was better tomorrow that would help me make my decision. The next day when I went to see her she looked right up at me and was eating and drinking again and I said to my husband, we have to treat her, how can we not do this? It was the look that made up my mind, she looked into my eyes and there was all the love and trust we had always known. We had to try. So she went to surgery and had her tumor resected (transitional cell cancer of the bladder) and a catheter placed which led to the outside through her abdomen. I became her nurse, cleaning and draining the catheter three to four times a day and tucking it into a body sleeve she wore outside for walks. She still walked slowly because her hind legs dragged a bit, but she was still Aja and we loved her. Once the catheter fell out around the end of October as I picked up Alex at school and we just piled in the car and headed up to the vet hospital. I only trusted them with her now. We stayed until past midnite and she was readmitted for a new catheter placement. I read about her tumor and knew the time was going to be short. We took her to Vermont again, and then drove her to Buffalo for Thanksgiving with my mom and family for a last goodbye. In mid November a dear friend died of pancreatic cancer suddenly and Aja and I went to the shivas to offer pet therapy to my friend?s sons. We had met walking our dogs! In mid December she stopped walking and I knew this was it. It was heart breaking but we did what we could to make her comfortable. I found extra special treats to give her and spent a lot of time petting her. We tried to find a vet to come to the home to put her to sleep as we could no longer move her. I sobbed at work making these arrangements on the phone. She could only lie on one side and the other side was getting swollen. My husband gently put a pain pill in her mouth and I arrived home the Tuesday before Christmas and she was breathing raggedly. She had waited for me to come home and then she breathed her last. The three of us, my husband, me and my son carried her down the steps in her blankets to the car and drove her to Katonah Bedford one last time. The vet was going to come the next day and we didn?t need him afterall. It was a sad Christmas that year, but our friends down the block brought us a CD with photos of Aja throughout the years (they met her as a 3 month old puppy!). We were dogless a short time but at the vet hospital I had read about the Guiding Eye program in yorktown where you can raise a puppy for 15-18 months before they are ready to go into training. By February Alex and I were taking prepuppy classes up in Patterson NY and at the end of April I went up to pick up Katonah, a 9 week old yellow lab for us to raise. And the circle of life continued. I called him Aja for a time (but he really wasn?t much like her!) but we really learned to love Katonah for himself. We remain however, staunch shepherd people (you know how people get attached to a certain breed!) Katonah is now in Yorktown training to be a Guide dog but we are still active with Guiding eyes as sitters and helping out other raisers. Who knows what the future holds; we are a little poorer and sadder but so thrilled that we could share our time with both Aja and Neffie and all our puppy friends at Guiding Eyes and my son is an amazing animal lover and a better human being for being raised in the company of animals. Aja and Neffie were loans from God. They were put in your care because God knew what was best for them here on Earth. As I read your story I am reminded of the pain I am living with after losing 4 German Shepherd Dogs, a Lab and a Cat. My GSD Stanley nearly took my last breath when he was killed. I believe they survive in the Spiritual World and are awaiting us. I commend you for your care of Aja and your devotion to your pets. Aja now lives in your heart and it's ok to cry every now and then. You and your pets will someday reunite. This will be God's gift to you and I.